The gaming industry in Nevada is the gold standard for the rest of the world and currently employs over 94,000 registered gaming employees. If you have just been hired to work at a facility that holds a gaming license, you will have to complete the application process according to the Nevada State Gaming Control Board. Not a problem! As an approved fingerprint vendor for the Nevada Gaming Control Board, we provide gaming fingerprinting services to thousands of employees and can walk you through the process so you can get to work as quickly as possible. There are a couple things to note when seeking employment with a gaming facility. First, the Nevada Gaming Control Board no longer issues physical work cards. Instead, they add your information to an online database which employers can search. Second, you can’t just apply for a gaming card in hopes of finding employment. Rather, a licensed gaming company must hire you before you can complete the process. There are a number of steps to complete, including having a Nevada gaming license background check done, before you will be able to start working. Once you have been hired by a gaming facility, your employer will register you with the Gaming Control Board. After you have been registered, you will be provided with a form to present for fingerprinting or login information so you can set up your online account on the NGCB website. You will then be able to complete the online application and pay the fee. Once the fee is paid, you will receive an emailed receipt that has a link to your fingerprint form (unless the form was provided by your employer). Print the form out. If you don’t have a way to print the form, email it to us and we can print it for a nominal fee. Take your fingerprint form (mandatory) to one of the Nevada Gaming Control Board fingerprint locations. 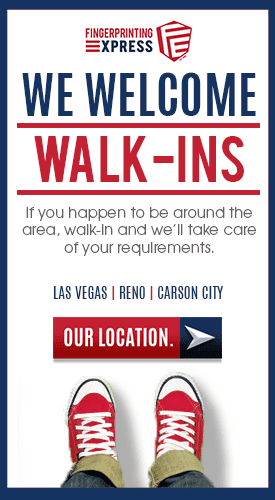 We have four convenient locations in Las Vegas, Carson City, and Reno to serve you that are all approved fingerprint locations for the NGCB. Have your Livescan fingerprints taken in our secure, private facility. We will sign and provide you with a stamp your ed form to return to your employer as proof that fingerprinting has been completed. As per the NGCB, gaming employees need to complete fingerprint renewals every five years to stay current and avoid a lapse in employment. Fingerprinting Express: Gaming Fingerprinting and More! In addition to helping with gaming licenses, we can also assist key-man licensees, and casino owner licensure and independent contractors for a Nevada Gaming company. As your one-stop-shop, we offer fingerprinting, Notary Public, and photo services—everything you might need to get the job done. We even offer mobile services for employers who need to have several employees fingerprinted in one convenient place. Contact us today at 800-919-0227 to learn more, or stop into any one of our clean, modern locations at your convenience. Q: Can I still work in the gaming industry if I have a criminal record? A: Yes. It is possible if you haven’t committed any disqualifying crimes. You can have a personal FBI Express System background check done on your own prior to applying for a position to see what is on your criminal history report. Q: Do you offer Livescan electronic fingerprinting and fingerprint cards for gaming applications? A: Yes, we offer both. You can have your prints automatically submitted via Livescan or you can have two sets of fingerprints taken as required by the NGCB. Q: Do you fingerprint for out of state gaming? A: Yes. We fingerprint for most states and tribal gaming applications as well as provide the necessary Notary and photos needed to complete your out of state gaming application.